Newham and Woodend Shire (1905-95) originated with the proclamation of the Woodend, Newham and Rochford Road District on 25 November 1861. The district, situated north of the Mount Macedon range, was about 60 km north-west of Melbourne. The area was traversed by the Calder Highway and the Melbourne to Bendigo railway line. The road district became the United Shire of Newham, with the addition of Woodend borough on 17 November 1871, and it became the Newham and Woodend shire on 11 January 1905. The shire’s administrative centre was at Newham until the mid-1880s when it was moved to Woodend. In 1994 the shire’s northern and southern areas were included in the Cobaw and Macedon State Forests, leaving 38% of the shire as farmland. Grazing was the main rural industry, with 4900 meat cattle and 15,000 sheep and lambs. 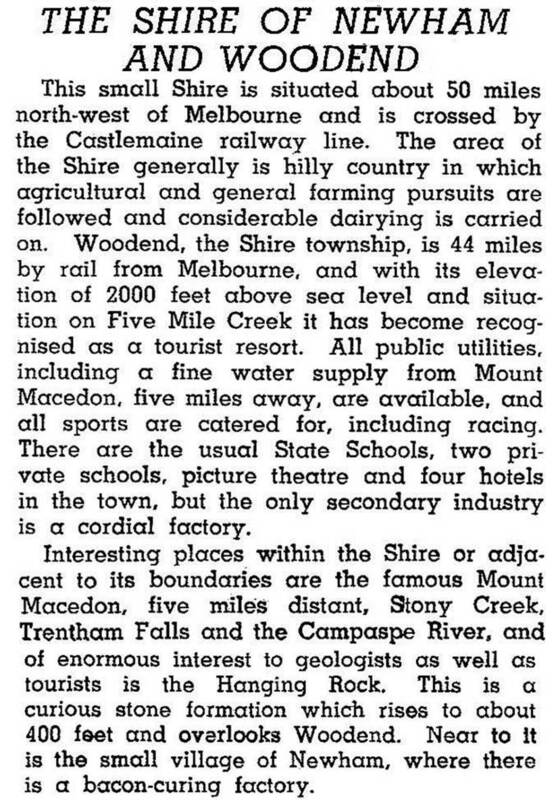 On 19 January 1995, Newham and Woodend shire was united with Gisborne, Romsey and most of Kyneton shires to form Macedon Ranges shire. The population growth between 1976 and 1991 reflected the improved car access between Woodend and metropolitan Melbourne after the building of the Tullamarine Freeway.